Hey there, DawgArt fans and friends! Bet you were wondering when DawgArt would have its annual holiday sale. We could have taken advantage of the craziness of Black Friday, the growing popularity of Small Business Saturday, or the relatively new Cyber Monday. But we figured, why not give you a little longer to shop? Never fear -- the time is here. 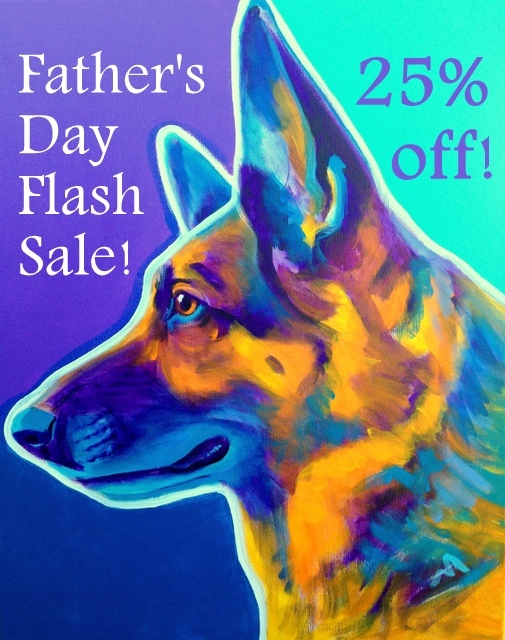 This sale has been extended, due to popular demand. Order your gift certificate today! Gift certificates are a great way to present the joy of custom artwork, a one-of-a-kind and unforgettable gift! 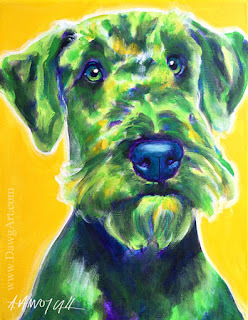 Gift certificates can be redeemed by the recipient for a custom pet portrait. The recipient will provide the photos of their pet and complete the process at their convenience. Gift certificates are 8.5 x 11 full-color, with examples of artwork, a customized message for your recipient, and instructions on how to complete the commission. I can even send you the image of the gift certificate through email, so that you can print it for gift giving at the last minute. Going through the commission process with DawgArt is fun and exciting, and makes a unique experience for your loved ones that will be capped off by a beautiful piece of artwork that will be treasured for years to come. You can get 20% off the price of an original painting currently in the DawgArt studio. These are pieces I've painted for exhibitions, shows, and as parts of series. All original paintings are acrylic on canvas, created entirely with traditional methods by me in the studio. Perfect for the art collector, or fan of a specific breed. *Please note: This sale does not apply to custom artwork to be completed for the holidays. 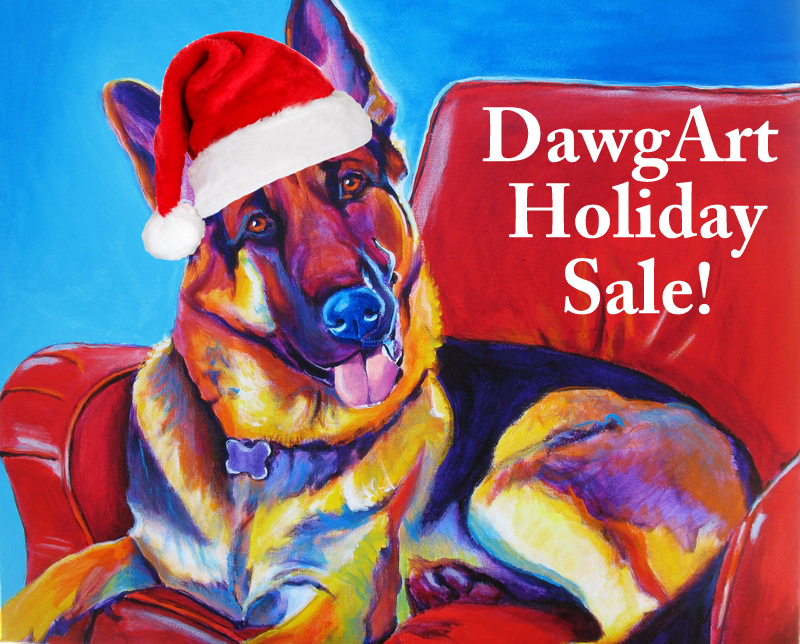 This sale only applies to gift certificates to be redeemed after Christmas, and preexisting paintings from the DawgArt studio. My waiting list for Christmas is closed and I am not accepting any new commissions for holiday completion, UNLESS you wish to pay exorbitant rush fees. If you do wish to pay for a rush, feel free to email me. *Update 19 Sept 2015: We succeeded in raising hundreds of dollars for WildCru. Thank you for all of your support! "My name is Alicia from Dawgart and this is a painting I made of Cecil the Lion. We are doing a fundraiser to raise money for the Wildlife Conservation Rescue Unit aka WildCru.org which is the program that was monitoring Cecil. 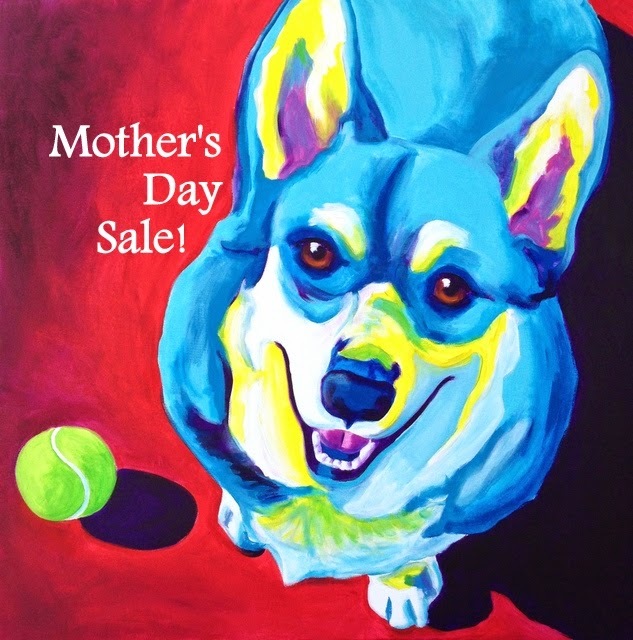 We're going to donate 80% of the proceeds from the sale of this piece. I hope to raise awareness. When you look at the numbers of how many are left it's staggering. Animals have a lot to teach us and their energy is so pure and vibrant and that’s what I try to capture on canvas. There’s been a lot of outrage over this incident. I’m the type of person that likes to propagate love instead of hate. That’s what my artwork is about. I would hope that instead of people rising up in hate, they would rise up together to accomplish a goal which would be to preserve these animals for future generations. The only way that we’re going to be able to save some of these species is if we make a concentrated effort to do so." A beloved African lion named Cecil, who lived in the Hwange National Park, was illegally baited away from the park and killed on July 1st, 2015. Cecil, with his black-fringed mane, and the rest of his pride, have been studied by the Wildlife Conservation Research Unit (WildCRU) in a program that has run since 1999. Cecil's movements have been monitored by tracking device as part of the study since 2008. Cecil's death has resulted in public outrage all over the world. Earth. I am sickened by the idea that my grandchildren could live in a world where these animals no longer exist. As a painter, I often focus on the natural world and our relationship to it. I use bright colors to convey the intense energy these creatures embody. 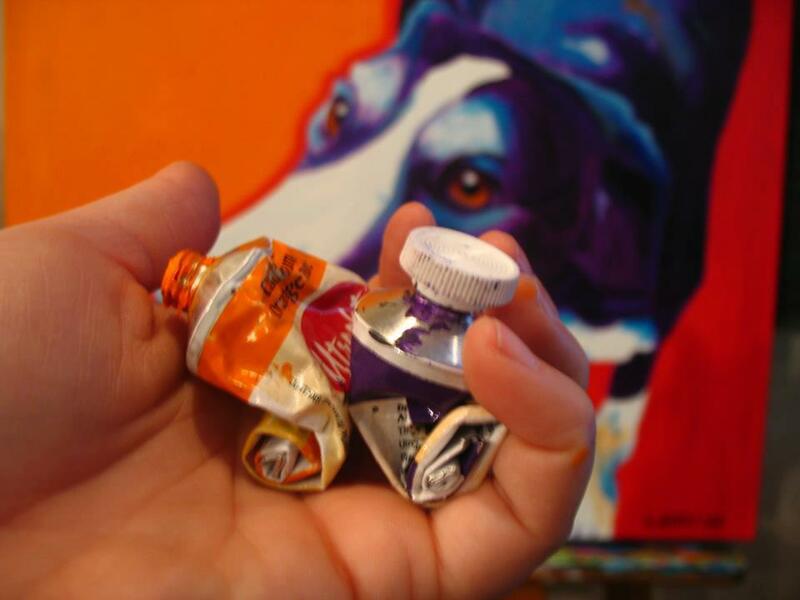 Through the colorful palette, I hope to capture the essence of living things, their purity, and their vibrance. 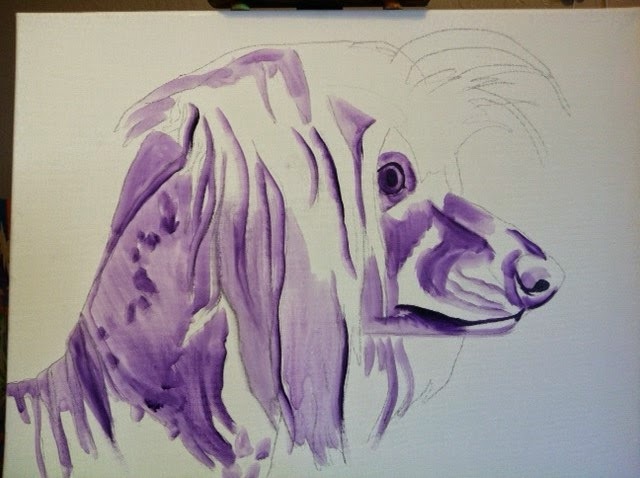 I've created a painting of Cecil. 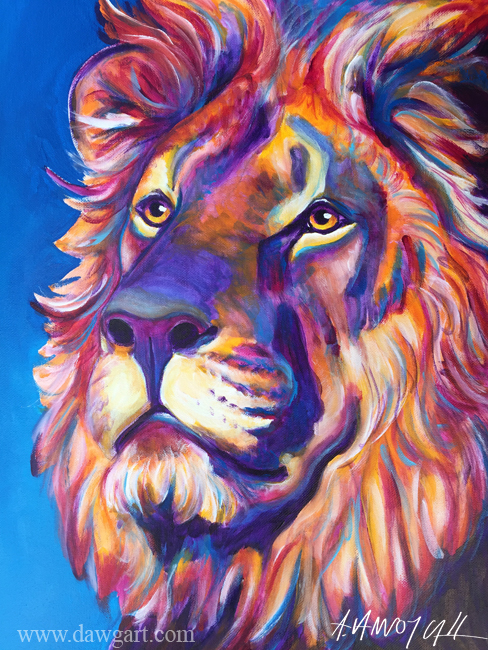 This piece was painted to honor the memory of Cecil the Lion, and to raise money for the Wildlife Conservation Research Unit (WildCRU), an organization dedicated to the conservation and preservation of these animals. 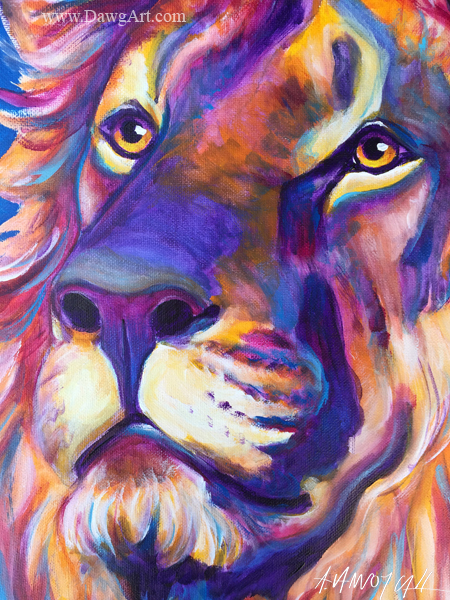 80% of the proceeds from the sale of "Cecil" will be donated to WildCRU. The piece is 16x20 inches, acrylic on canvas, wired and ready to hang. If you can't afford original art, you can get a print of Cecil's painting here in the Etsy shop. A portion of the proceeds from the sale of prints will also be donated to WildCRU. Please share this post on all your social media outlets and help spread the word! Watch me paint Dancing Nathan's portraits! 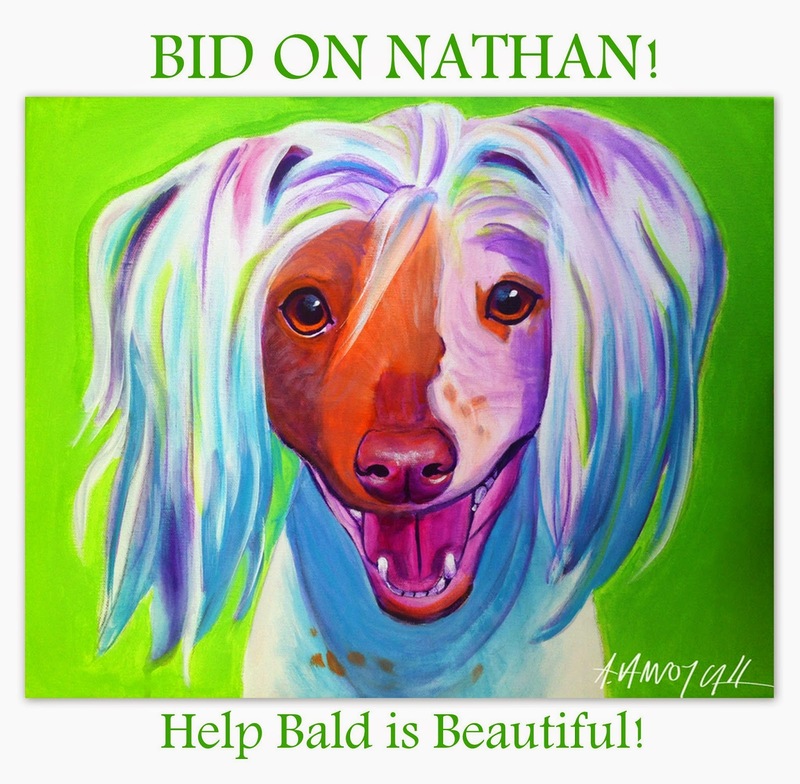 Getting excited for the Bald Is Beautiful Dancing Nathan art auction? What's that? You haven't heard about it? First things first. Dancing Nathan is the Chinese Crested, hairless, dancing dog who brought all sorts of awesome publicity to the rescue who gave him a second chance. See his dance moves here. DawgArt is the fine art brand created by Alicia VanNoy Call specializing in brightly colored pet portraits. I LOVE rescued animals, and I love the angels who work in animal rescue. I know their jobs are tough, having to deal with heart-breaking stories every day. I know that after people helping through adoption and awareness, rescues need money. That's where DawgArt comes in! I paint a portrait of a special rescued animal and we offer the painting for auction. 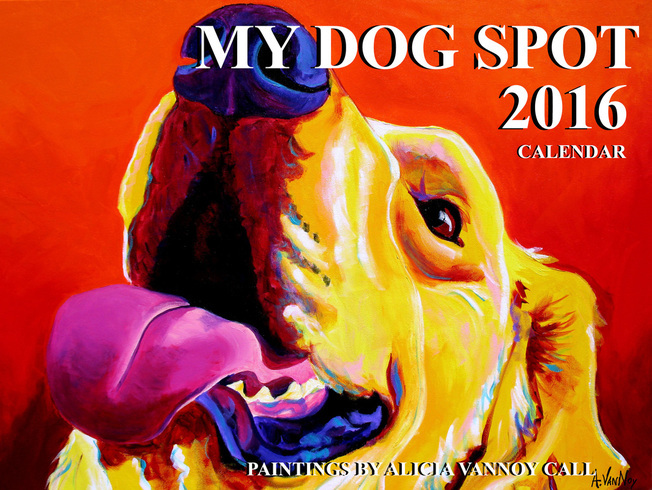 Then the proceeds are donated to the rescue to help animals in need. With a personality as bright as Nathan's, DawgArt and Bald is Beautiful thought my artwork would capture his vivacious spirit. Here are his paintings, and they were so fun to make. What a personality this guy has! 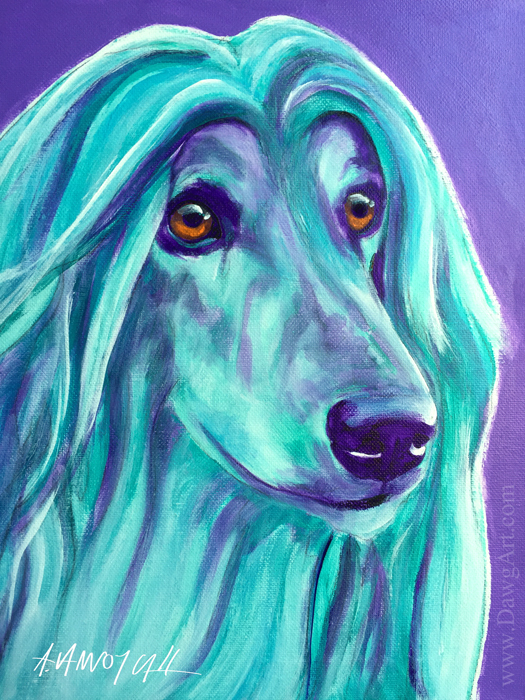 Each painting is 16x20 inches, acrylic on canvas, We're going to offer both portraits for auction to raise funds for the rescued animals at Bald Is Beautiful. The paintings will be listed over on the DawgArt DailyPaintWorks Gallery. We're going to spend the week telling the world about the auction, before the paintings are available, to get everyone excited. 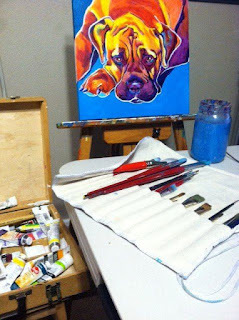 Get ready for the auction by seeing how I made both portraits. 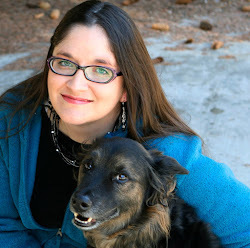 Click here for the big grin, and here for the profile, or scroll down to see them embedded. Want to know how you can help? Fans of Nathan and DawgArt, share this blog post to help spread the word. And then stay tuned for links to the auctions. See you soon! Dancing Nathan Portrait #2 is done! 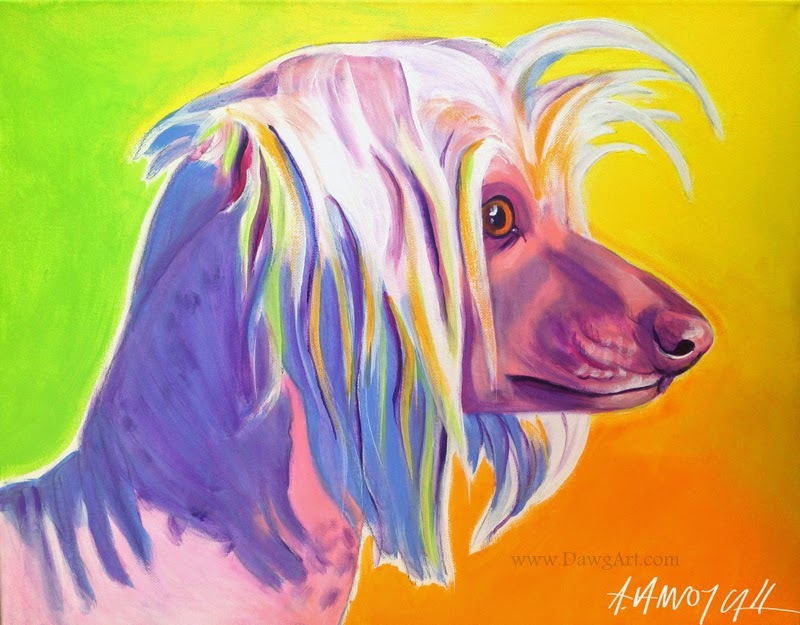 Dancing Nathan, the silly Chinese Crested hairless dog, whose dance moves have appeared on The Ellen Show, helped bring attention to his organization, Bald Is Beautiful Dog Rescue. Now DawgArt and Bald Is Beautiful are teaming up to raise money for rescued animals! Details here. Want to join in the fun? Tune in tomorrow to see where the paintings will be listed for auction and how you can help. Dancing Nathan Portrait #1 is done! Great news! Dancing Nathan's first portrait is done. 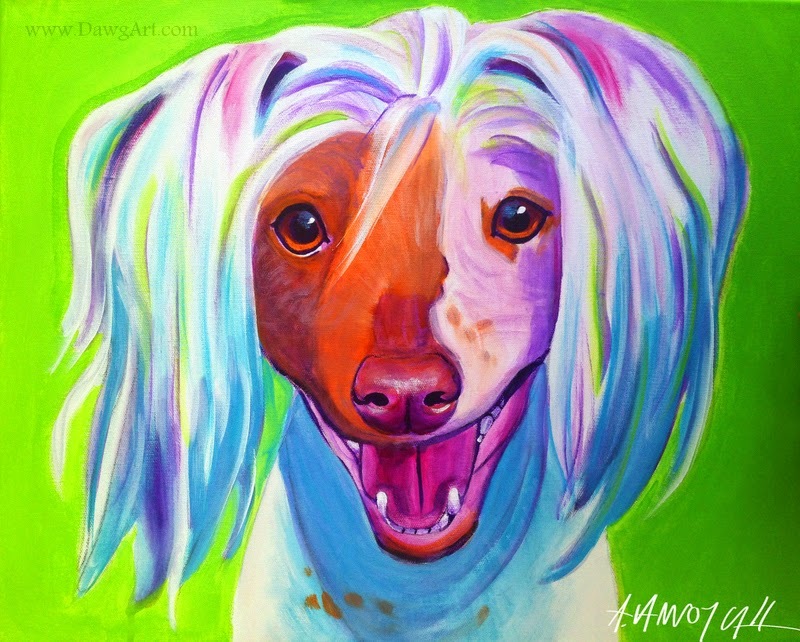 Nathan, the effervescent Chinese Crested hairless dog from Bald is Beautiful Dog Rescue, made the rescue famous when his dance moves went viral. Now DawgArt is helping them with a fundraiser. 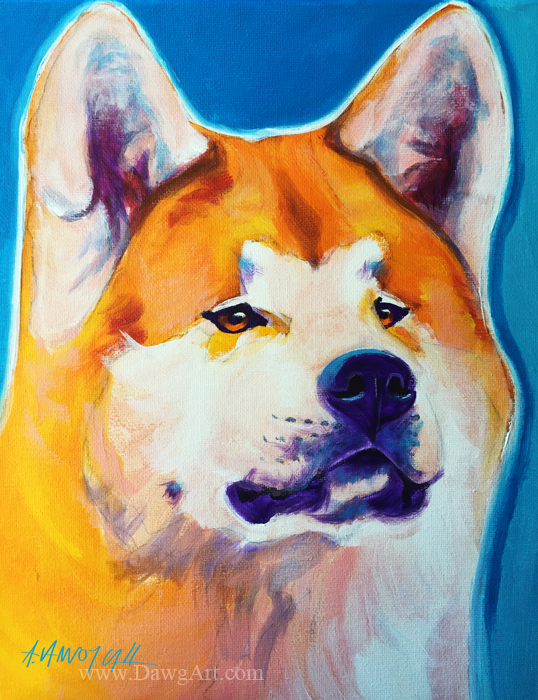 I'm making two paintings of Nathan, and we'll auction them to raise money for the rescue. See the details here. I have another painting to finish and then you'll get a chance to bid on both! Pass the word along so we can get people excited about helping the sweet pooches with Bald is Beautiful. DawgArt and Bald is Beautiful Dog Rescue are teaming up to bring you the happiest of fundraisers. See the details here. 1. This blank canvas is so blank. I'm going to fill it with a great painting. 2. 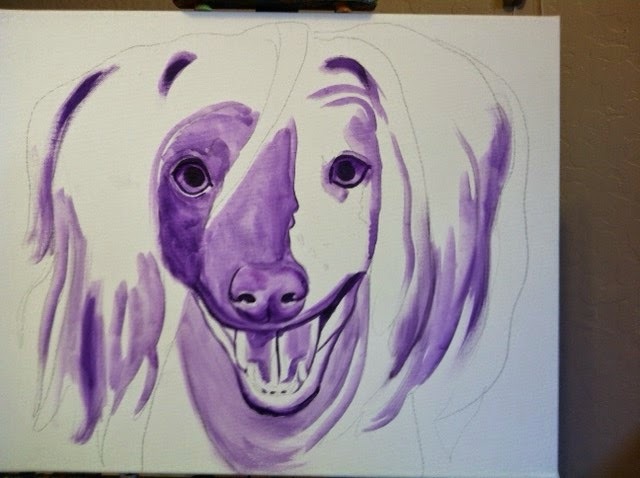 This painting isn't looking so great. 3. This painting is definitely not great. 4. What was I thinking? 5. Maybe it will be okay. 6. This painting is great. So any progress images I share are going to be at some point in that process. All the steps add up to something great, but along the way, it's not quite so impressive. Enjoy the process and when it's done, you'll be able to bid on one-of-a-kind paintings of Dancing Nathan to help raise money for Bald is Beautiful Dog Rescue! You guys know Dancing Nathan, the Chinese Crested pop sensation? His dance moves went viral, gaining much-needed publicity for Bald Is Beautiful, a hairless and small breed dog rescue operating out of South Carolina. If you haven't seen Nathan's awesome dance moves, check him out here. Nathan's joyful and goofy personality won over the Internets. His video even appeared on The Ellen Show! In cooperation with Bald Is Beautiful and Nathan's mom, I am going to be painting a portrait (maybe two) this sweetie-pie dancing diva. The piece will then be auctioned to raise money for Bald Is Beautiful! Stay tuned to see progress of the piece and have fun dancing! Wildhorse Ranch Rescue Fundraiser for Einstein! One of my favorite rescues to work with is Wildhorse Ranch Rescue in Gilbert, AZ. Not only is the founder and chairman Kim Meagher a wonderful person, she's a dear friend. I just love her. She is one of the kindest human beings I know. She started Wildhorse Ranch when she discovered the plight of homeless horses in 1995. She and her children privately rescued horses until 2000, when she applied for non-profit status for WHRR. With the help of many friends, volunteers, and donors, Kim and WHRR have been able to help save many horses from abuse, neglect, and death. 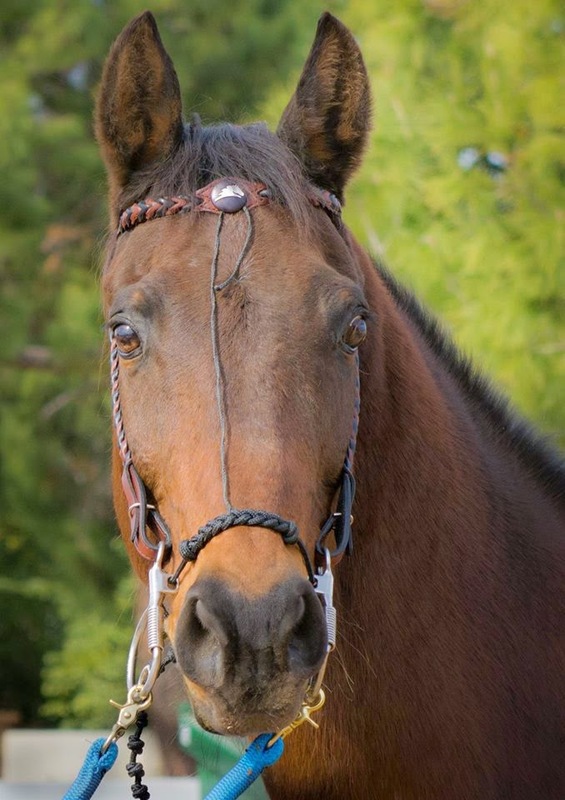 This past week, when they were travelling back from an event, someone on the freeway slammed into the horse trailer, resulting in serious injuries for Einstein, a much-loved horse rescued by WHRR. In order to help raise money for Einstein's care and recovery, I volunteered to make some artwork featuring Einstein. We are auctioning these paintings, the proceeds from the sales of which will be donated back to WHRR. Scroll down to find bidding links. Here are the paintings, both acrylic on canvas with color wrapping around the edges. 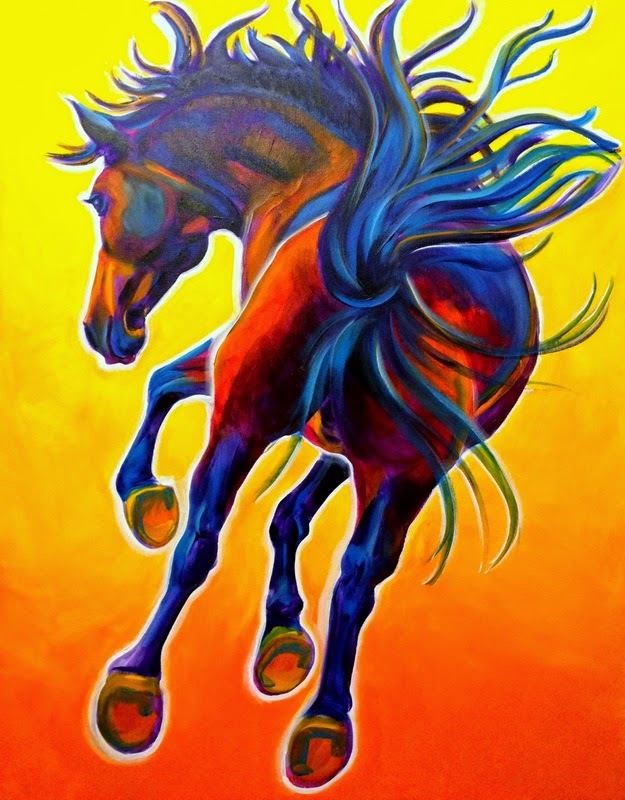 "Kick Up Your Heels" - 24x30 inches. This piece is large and stunning with vivid colors. This image celebrates the energy and joy of a rescued animal, rendered in the brilliant colors of the Southwest. "Little Sister" - 16x20 inches. This piece is smaller, but no less vibrant. 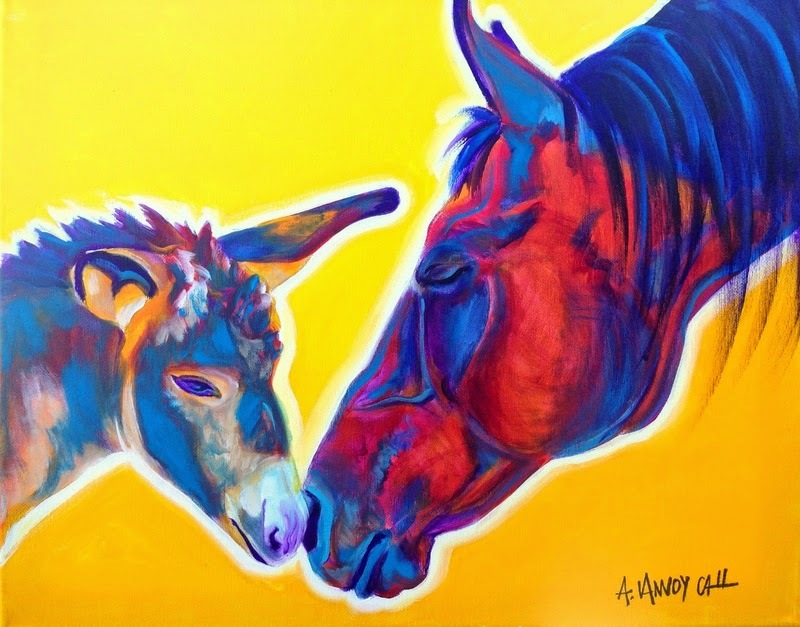 It features an image of Einstein meeting his new little herd sister, Pixie the burro. The original reference photo hangs in the barn at the ranch. I love it because it reminds me of the unfailing generosity and devotion of Kim and the rescue angels at WHRR. That a strong bond can be formed between the most unlikely of friends. Auctions will end on Sunday night, February 1st at 9pm. Please share this post with your friends and your network to spread the word about Einstein and WHRR. 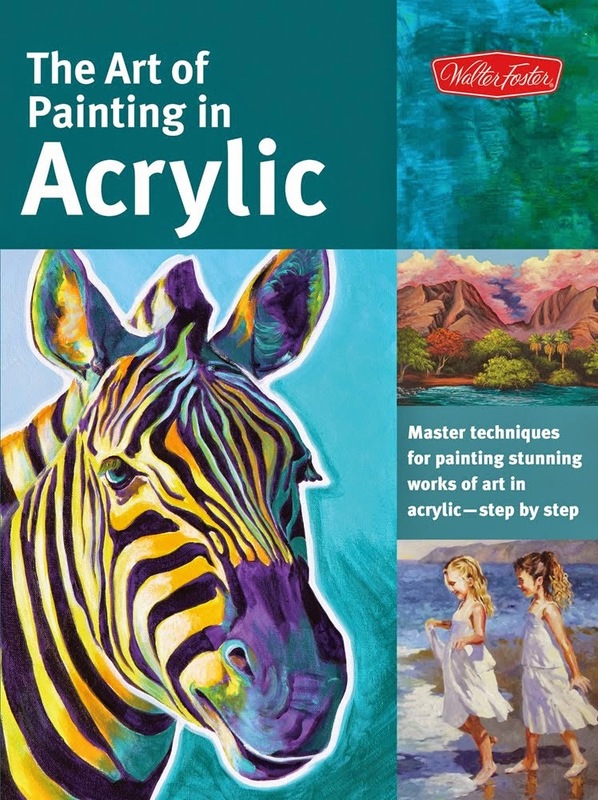 Want to see how I made the paintings? Click here if link doesn't embed.